Transcript: Hi, I’m Attorney Shaffer. 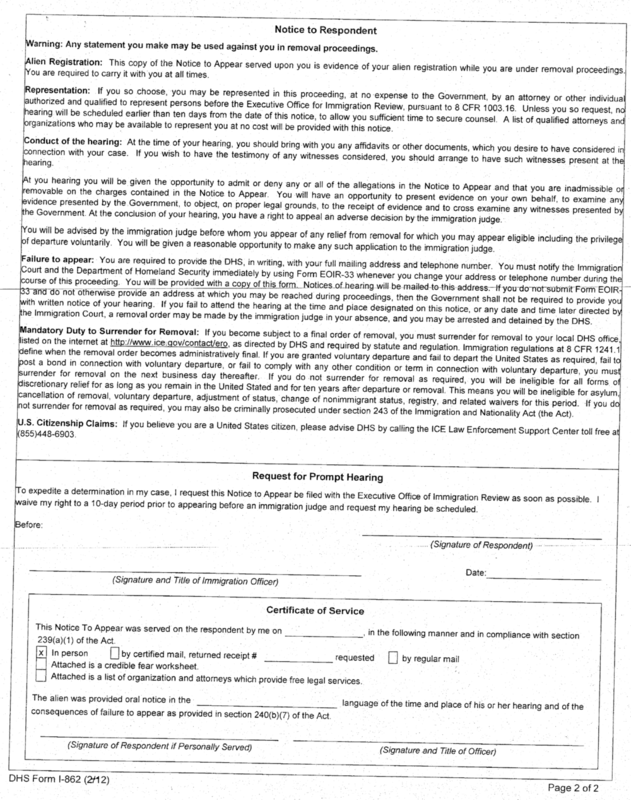 Today on “What You Really Want to Know,” We answer the question, I just received a Notice to Appear in Immigration Court, what is it and what does it tell me? This is the first notice that you receive from the Department of Homeland Security that lets you know that the government is trying to kick you out. It is an extremely important notice that is going to guide the rest of the Removal Proceedings. So it is important to understand what is in it and oit can be broken down into several sections. 1. You are not a U.S. citizen or national of the United States. 2. You are a native and citizen of your whatever country or countries the government believes that you are from. 3. You entered the country on a certain date and through a certain city and whether or not your entry was authorized and if so, for what period of time. 4. Charges of Removability - This is where the government will cite to the section of the Immigration & Nationality Act that they are alleging that you violated. 5. Date & Place of Proceedings – This will tell you when and where you have to appear for your first hearing in Immigration Court. A lot of times, just as in the sample notice that I am using, this section will either be blank or say TBD (to be determined). If that is the case, you will receive another notice in the mail advising you of when and where your proceedings will be. 6. Legal Warnings and Certificate of Service – Tells you about consequences of failure to appear, your right to an attorney. The Certificate of Service will be filled out by government to prove that they provided this notice to you. If you receive a Notice to Appear (NTA), what should you do? Immediately contact an experienced immigration attorney today. You have the right to defend yourself against deportation. The government is required to prove all of the charges contained in this document before they can actually and physically remove you from this country. You also have the right to prove that even if you are removable, that you are eligible for some sort of relief from removal. Only an experienced immigration attorney can help you determine what your best options are, and what if any, relief is available to you. Contact us today to find out the best way to defend yourself from removal/ deportation. That’s all for this episode of “What You Really Want to Know,” thanks for watching!